Downey Daily Photos: Never forget! Today is the 11th anniversary of the September 11 attacks. 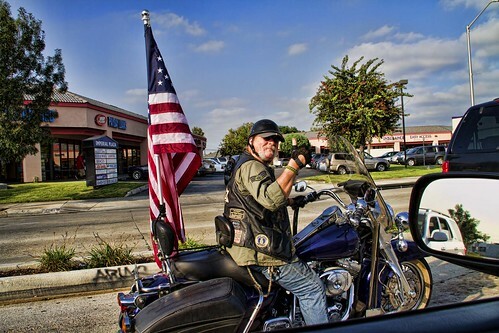 As I was driving around town looking for some kind of memorial, I saw Jim Fuller on his bike. Jim remembered Sept. 11th, 2001. I remember that morning. Watching the planes hit the World Trade Center building towers was surreal. It was shocking to watch, I struggled to comprehend what was happening. It was a day I don't think I will ever forget (and I watched from the relative comfort of my home). The memorial in DC is open. Americans from all over the country can visit and honor the thousands of innocent men, women and children who lost their lives 11 years ago. Reading about the memorial made me think of President Lincoln's speech at Gettysburg after the devastating battle that settled the Civil War. I am thankful there was someone out there remembering and honoring the victims of 9/11.